I am a biggest fan of Nigella Lawson for more reasons than one..... her cooking style, the way she speaks about food, her recipes and many more. When you look at her, you instantly know that she enjoys food wholeheartedly - in every form, every cuisine and every dish. So when I came to know about this lovely event going on in www.Maison Cupcake.com , I was more than excited. Coming to think of it I don't have any cookbooks written by Nigella .... you know why???? When browsing through her website, "Oh my god"....!!!!! 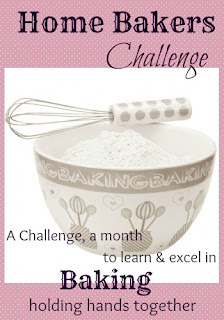 I had to choice one or two recipes which proved even more difficult than actually cooking it. 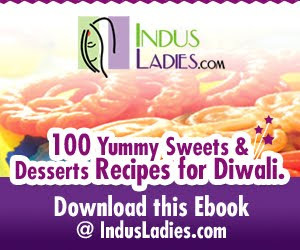 a.reduced the amount of sugar by 60 gms [the original recipe calls for 300gms]. b.used chocolate drops instead of chopping a bar [tip by Nigella herself]. c.used sherry vinegar instead of balsamic vinegar. Egg whites [medium eggs]: 6. Dark chocolate drops: 50 gms. 1.Preheat oven to 180 degrees/gas mark 4. Line a baking sheet with parchment paper. Draw a circle approximately 23cms in diameter. 2.Beat the 6 egg whites until you have a shiny peaks forming [5-7 mins]. 3.Add the sugar - 1tbsp at a time and beat well. 4.When all the sugar has been added, the mix would be stiff and shiny. 5.Add the chocolate drops and vinegar. Sieve the cocoa powder onto the egg white mix. 6.Fold everything together gently until all the ingredients are well mixed. 7.Scoop the mix onto the sheet and smooth out the top and sides. The circle should be around 23-24 cms. 8.Place this in the middle rack and immediately bring down the temperature of the oven to 150 degrees/ gas mark 2. 9.Bake for 1 hr and 15 minutes. Switch off the oven and leave the oven door open slightly. 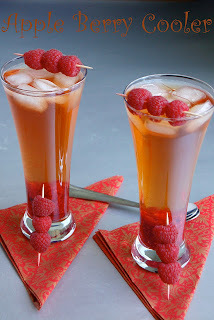 Raspberries: 400 - 450 gms. Dark chocolate drops: 1-2 tbsp. 1.Whip the cream until you have the whipped cream consistency. 2.Whiz the chocolate drops in a mixer grinder ..... yes I whizzed them just for 5-6 secs to get a sandy grainy form. Scoop the whipped cream on top of the pavlova. 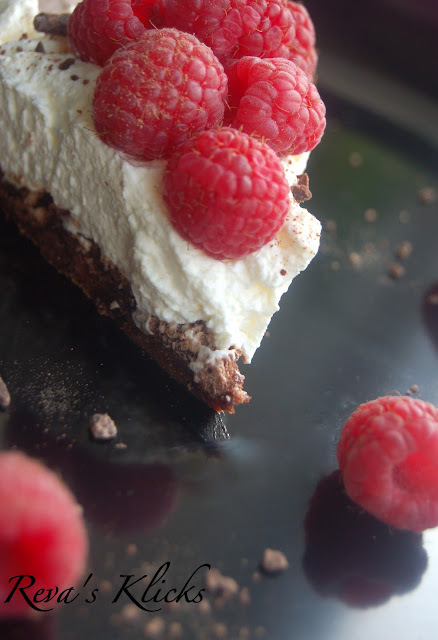 Tumble the raspberries on top of the whipped cream and sprinkle with the chocolate rubble. 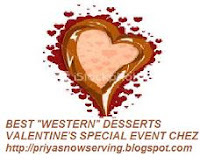 Ur efforts has been paid Reva,..Yep, it's outstanding and I love pavlova..Love the clicks, ep, 3 rd one from the last..
Thats an elegant dessert, looks gorgeous..
Looks so delish... sooper clicks! Reva.. Your admiration towards Nigella has turned into a beautiful love filled pavlova... It looks fantabulous! This looks super delicious I wish I had some. Very new to me too..Love the part of using only Egg Whites..Great!!! 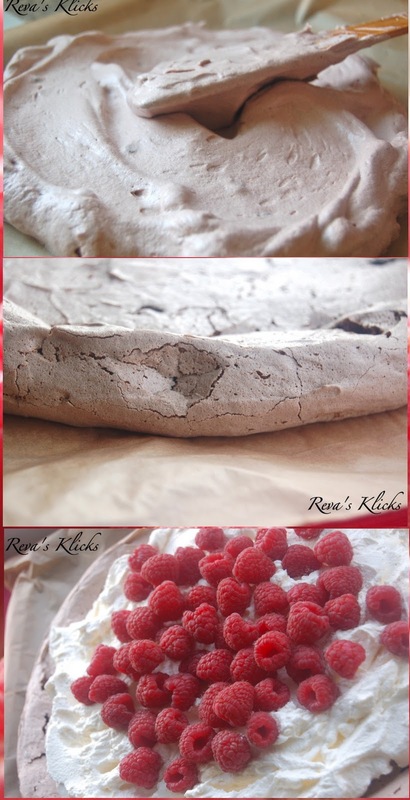 Chocolate Pavlova looks so yummy and wonderful with raspberries. Reva dear,meet another fan of nigella here.lol.I love her so so much.Especially the way she enjoy cooking and eating. 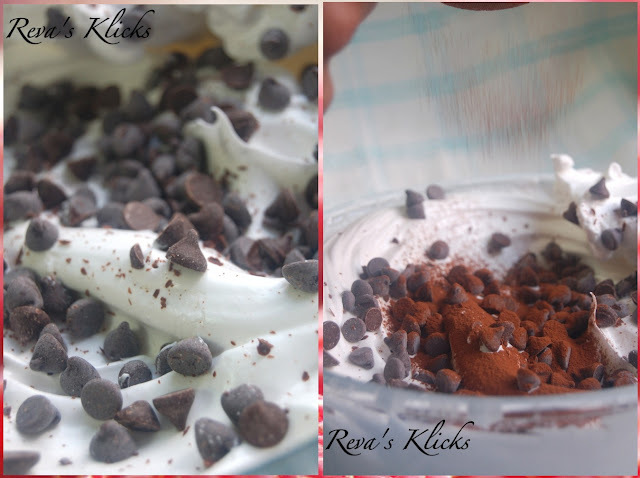 This is such an awesome effort from you Reva.Hope you really enjoyed..!! It came out very nice..looks very very tempting..
What a decadent dessert! Lovely presentation. Oh myyyyyy ..reva this is awesome.. Thanks for taking part in Forever Nigella even though it was your first time cooking one of her recipes! I love her TV shows, her kitchens in the various series are gorgeous. 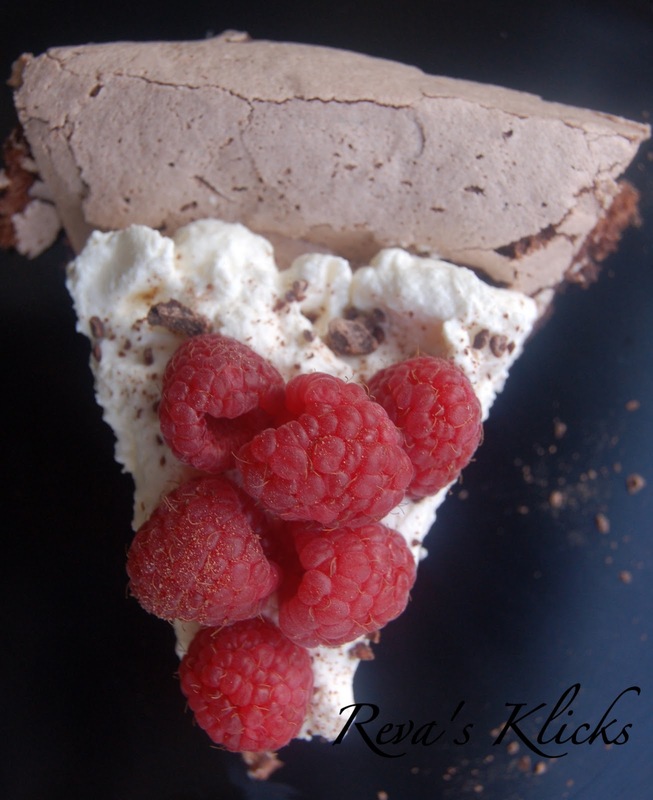 I'd forgotten about this chocolate pavlova - you seem to be the only person who has done it so far. I love your pavalova and Nigella too..her recipes are amazing.. I like Nigella too. She does seem quite passionate about the food she cooks. The pictures show how well you got this done. 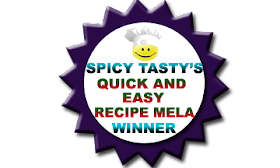 Awesome recipe and clicks reva...tickling my tounge! i have seen this video of Nigella for Chocolate Pavlova innumerable times and i totally adore it! i am a huge fan of Nigella and am totally in love with her show. I can see u have recreated the same pavlova excellently. Wow the pavlova looks so gorgeous. Feel like grabbing a bite straight from the screen. Sigh!!! OMG Reva!! This looks eaxctly like wht Nigella had made!! Kudos to you!!!!!!! 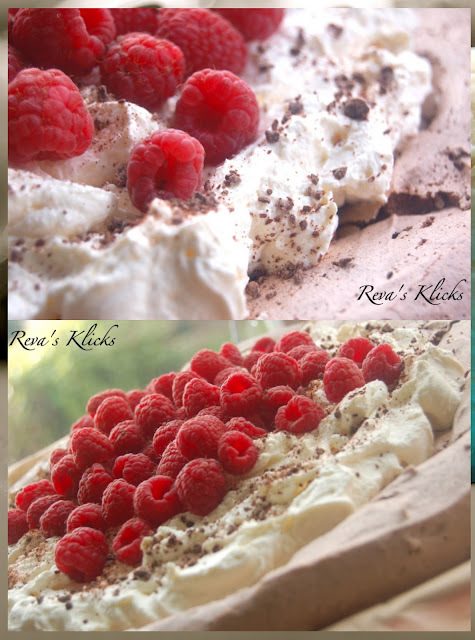 the pavlova looks so professional i mean it looks like one on the bakery self...wow!